What a surprise..! We have received a great gift from Codemasters (@Formula1game), a UK company which is an exclusive Formula 1 video game retailer! 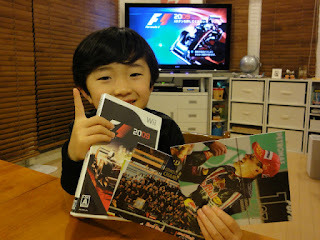 They saw the cardboard Red Bull race car that I made for my little son, and sent the Formula 1 2009 Game for Wii along with Red Bull Racing post cards as a present for my son from the UK. He is so thrilled. As soon as he opened it, he jumped into the cardboard Red Bull machine and started the game. 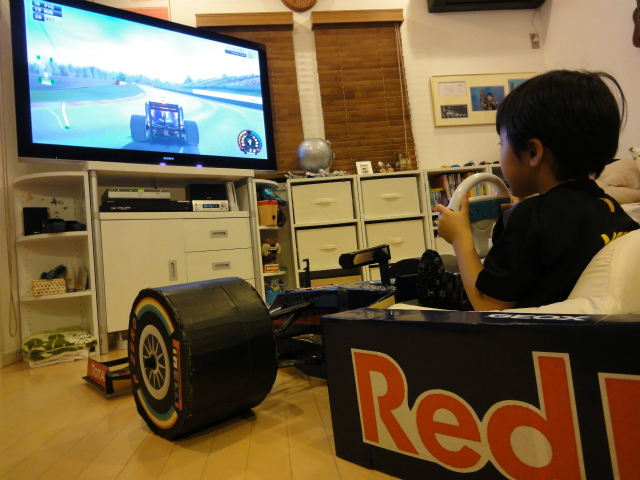 The machine and the driver he selected were - Red Bull and Vettel, of course! 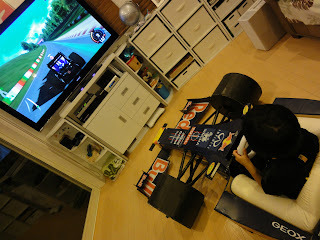 The game seems to be a little difficult for a 4-year-old boy and he has continuously finished last so far.. But it doesn’t matter! He is over the moon and keeps playing feeling just like Vettel! Once again, Thank you so much, Codemasters!